Happy Tuesday!! 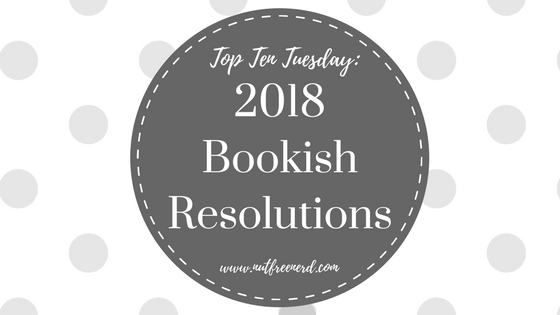 This week’s Top Ten Tuesday topic (now brought to us by That Artsy Reader Girl) asks us to share our bookish resolutions for 2018. Now that the new year is well underway and I’ve done some reflecting on 2017, I think it’s time to set some new goals. I don’t like to put an exorbitant amount of pressure on myself to meet unrealistically high expectations, so these are ten relatively simple goals that I’d like to keep in mind throughout the next year. 1. Read 24 books. I’ve made this my Reading Challenge goal on Goodreads for the past few years now and it’s worked out really well. This is a number that I can meet without any added stress, which is precisely what I need from a yearly goal. 2. Balance reading for classes, reading for fun, and blogging. 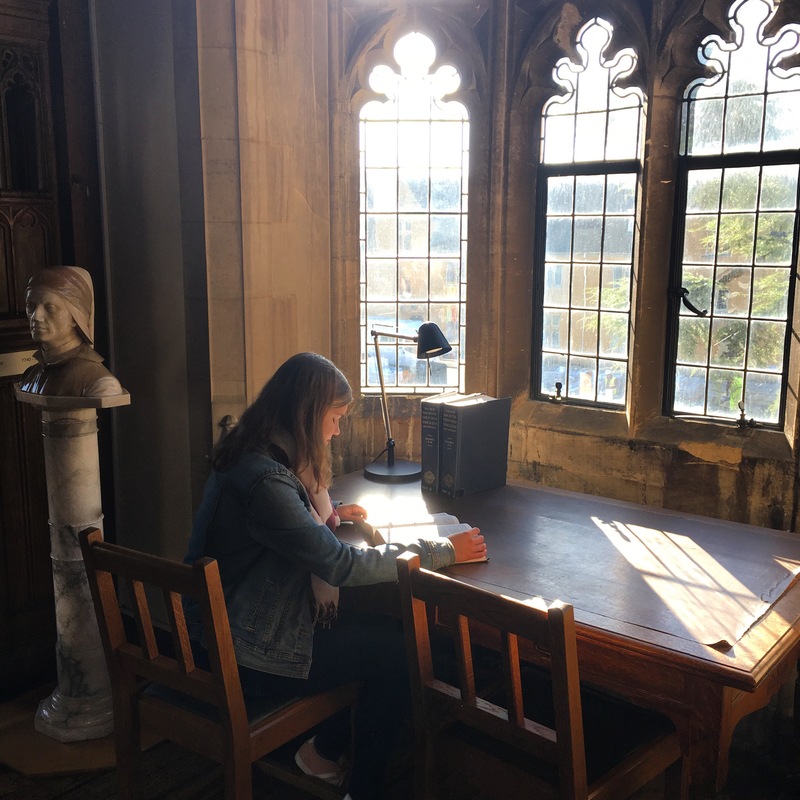 I absolutely LOVE studying abroad at Oxford, but when term is in session I miss blogging and reading for fun so much! I’m hoping I can figure out a way to balance all of these things better during my last two terms there. The main library at Mansfield College, Oxford. 3. Be more engaged with the blogging community. This goal is one that I wish I had done better at in 2017… so I’m carrying it over into 2018! As with the previous resolution, I’m hoping that I can find a way to make this work while balancing everything else I have to do. 4. Read more nonfiction. I’ve read some really great nonfiction books recently, which makes me feel motivated to read even more of them in the new year. Any recommendations would definitely be appreciated! 5. Read A Game of Thrones by George R.R. Martin. Now, what would a Holly resolution list be without this novel inevitably included? I vow that someday I will read this book! 6. Continue writing discussion posts regularly. This is a resolution I accomplished in 2017, but I would really love to keep it up this year as well. Creating interesting, thought-provoking content that sparks engaging discussions is something that I want to always strive towards with this blog. 7. Keep better track of the books I want to read. More often than not I forget to write a book title down when someone recommends it to me, leaving me without a list of books I want to read whenever I go into a bookstore or decide to order books online. Putting them on a list in my phone or something similar would be so helpful! 8. Be more creative with my bookstagram posts. I love taking photos and updating my bookstagram, but in the midst of writing pages and pages of essays it’s easy to revert back to posting the same kinds of photos every single time. This year I’d like to be more creative with my books, props, scenery, etc. 9. Be more open to talking about this blog IRL. I rarely ever mention my blog to people unless they bring it up first, and even when they do I’m pretty hesitant to talk about it (as I’ve discussed in this post from a while back). In 2018, I’d like to be more open about talking about my blog if people bring it up. 10. HAVE FUN!! As always– what’s reading without a little (or a lot!!) of fun? What are your resolutions for 2018? What do you think of mine? Any advice on how to accomplish them? Let me know in the comments section below! Great resolutions! I especially like the last one. I know how tough it can get to allow yourself to read for pleasure when you’ve got so much school-related reading. But at the same time, I think I’d go crazy if I didn’t read for pleasure at least a little! I think you already do 3 and 6 really well!! I am with you on all of your blogging resolutions for this year- except Game of Thrones- I just know I won’t get around to reading them all. I’ll just continue watching the TV show…although it isn’t on till 2019!!! It doesn’t come back until 2019?!?! That’s SO far away!!! Game of Thrones was really good, I hope you get to it this year! I love reading discussion posts, so I’m excited to read the ones you come up with! Thanks so much! 🙂 Glad to hear that you liked Game of Thrones. Can’t wait to read it! Sounds like a good list to me. I hope you’re having a good 2018 so far and are able to accomplish these resolutions. I relate to many points. The second in particular. My academy is something that requirs a lot of my time. Sotimes I don’t manage to blog because I’m too tired. Same thing with reading and writing. I want to read more non fiction too, but with a focuse on the ones tha are related to my writing esearch. Even if sometimes online article and tumblr stuff from real peopleare much more interesting and direct. I started to talk a lot more of my blog in real life and the experience was quite pleasant. People were quite happy or interested to hear about it, or didn’t say anything bad either. Which was great. These all sound like great goals! Game of Thrones is one of those rare few where the adaptation is better than the book. Still, there are points of interest in it. Good luck in your classes, make sure you enjoy them too! 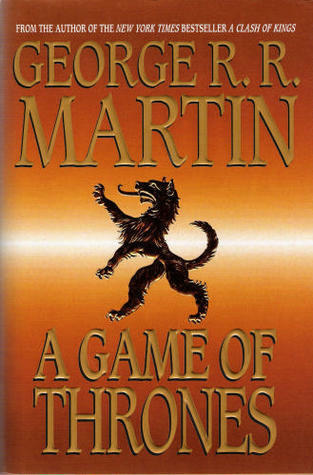 I’ve heard so many people say that the GoT TV series is better than the book series… guess I’ll have to find out! 🙂 Thank you!! Nice goals! I keep thinking that I will read Game of Thrones too considering I am a huge fan of the series 😀 But here I am 🤣 I want to read more nonfiction too. When I started using goodreads to keep track of my books it was life changing– it makes it so easy to save random book recommendations I get. Goodreads is SUCH a life saver. I honestly can’t even remember what it was like to read without it…. Good luck on all of your goals this year. I too would like to engage myself more with the blogging community. However, I didn’t think to put it in my own resolutions post. I guess I’ll just have to make it on of those impromptu things. Thanks so much! 🙂 Impromptu goals are always a good thing! Wow Oxford!! Sounds amazing. I too want to increase my blogging engagement this year. I thoroughly approve of these resolutions. Having fun is so important and keeping blogging chill is vital too. Be more engaged with the blogging community is such a great resolution and one I need to add to my own 2018 goals list! I’m also trying my hand at making my bookstagram account more creative. I think it’s working because I’ve been steadily getting more interaction and have even gotten a couple compliments here and there! Best of luck to achieving all these resolutions! Haha I know, I’m likely the only person left on earth who has never seen or read GoT!!! *dodges dirty looks* I think I’m going to tackle the first book this summer! All the best in all this Holly!